*This post is brought to you in collaboration with Gumtree. With our eldest daughter studying year 12 this year, having a dedicated space for her to studiously work is a must. 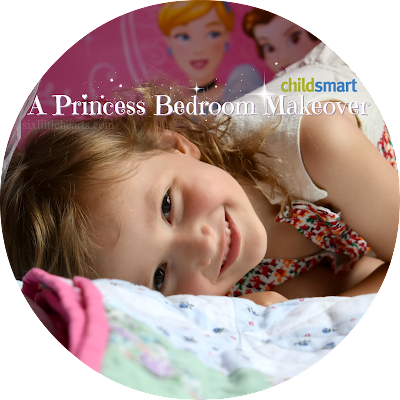 Daily there are hours of homework tasks to plough through, so an area that's comfortable and welcoming in our home is essential to assist her to feel motivated, focused and hopefully, a little more stress-free. Supporting a child in their final year of school is a costly affair. 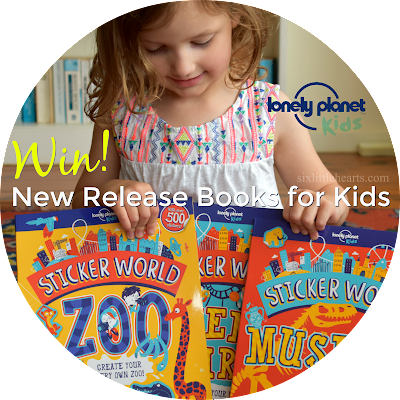 Books, excursions, incursions and special uniforms are just some of the essentials which add up quickly. 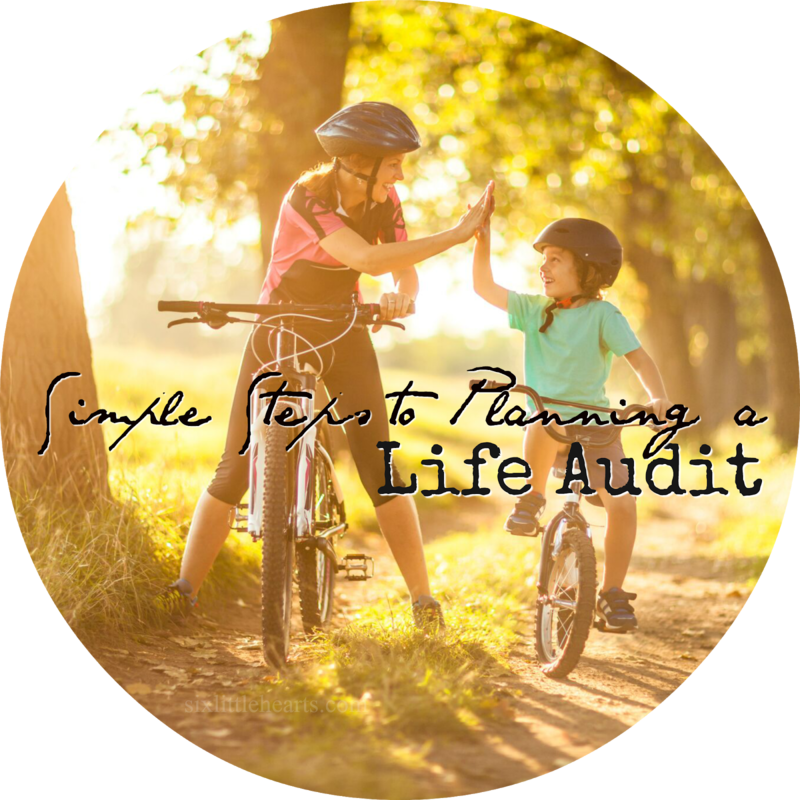 Finding cost-effective ways to make ends meet as a parent is not only sensible, it's also necessary. 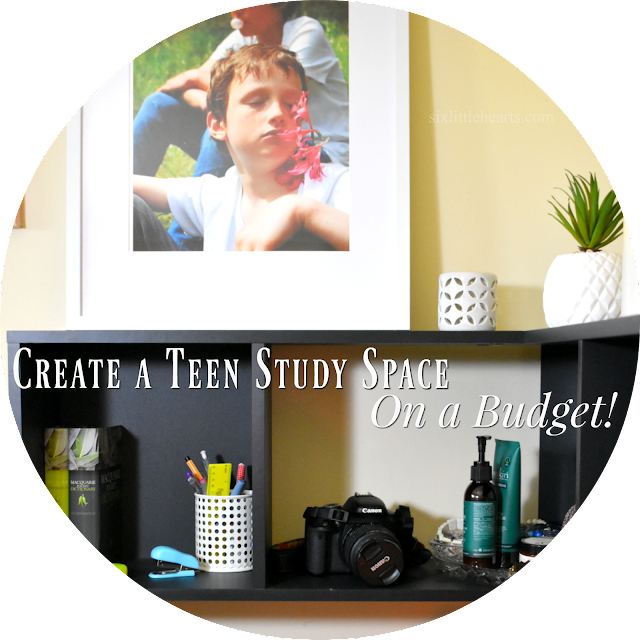 Creating an attractive, purposeful study space needn't be a budget-breaker. With thanks to Gumtree, we were able to create a teen-approved work zone that our daughter not only uses daily, but also loves! The cost? Barely anything! So what exactly do you need to create an ideal space for your child to work in? To start with, think about how you would like the overall study area for your student to look. Take into consideration current colours, textures and trends overall, but focus on the fundamentals first. What furniture do you need to make a study space, and ultimately, how much can you afford to spend? In our case, we needed a basic and compact desk and office chair to make our project happen. 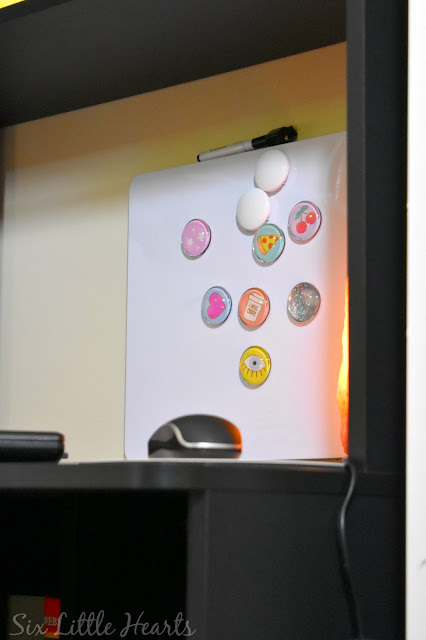 We also had to ensure there was enough space in our daughter's small bedroom to fit the intended study area. With these points in mind, it was an easy browse on the Gumtree app to source our main feature item - a desk. 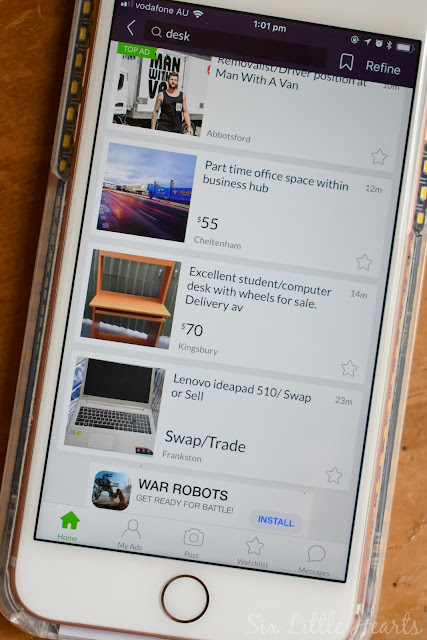 The Gumtree app is simple to use. Gumtree is an Australian online community marketplace and using it to seek out anything you require is a prudent move. We're no strangers to Gumtree in our household. We have relied on it many times over the years to purchase everything from new and used bunk beds, to dining chairs and even antiques and all at a fraction of the cost - especially when compared to buying new. Gumtree is a great place to buy from for a number of reasons. Price-wise, you can find many items both locally and further-afield which are in great condition and priced to sell. You can filter your searches on both distance and price, as well as 'favourite' and save your searches for items which you think may fit your needs so that you can compare before you buy. My best advice though when using Gumtree, is to use your imagination. Try to creatively think around an item's presentation and how you might bring it to its full potential with a lick of paint or some savvy accessorising. Accessorise, Accessorise! Accessorise! 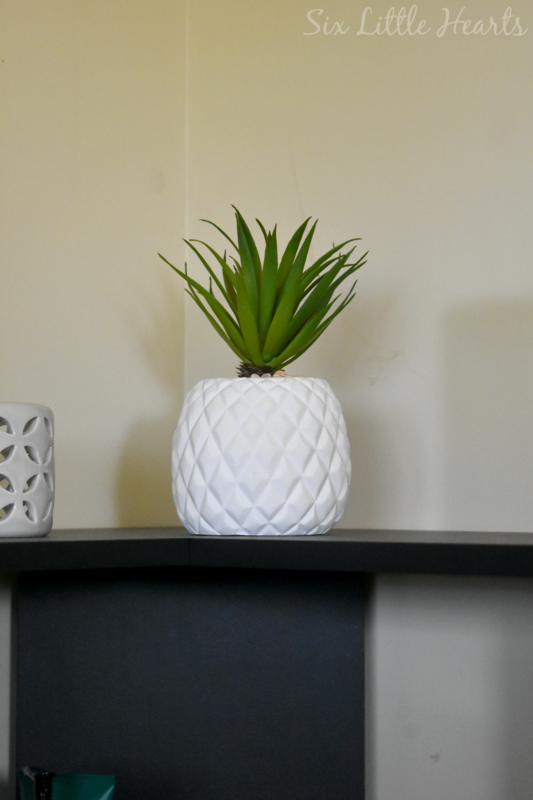 Fake plant from Kmart. Initially I was prepared for a bit of a hunt and search to find an ideal desk on Gumtree that would fit into our available space, but it wasn't to be in this instance. 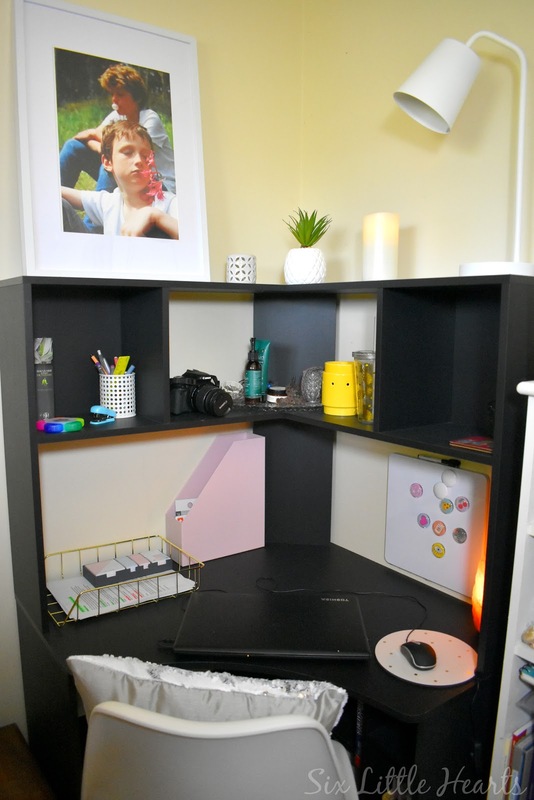 After performing a quick local search on Gumtree's mobile app in my own area, I found this almost-new, fantastic corner unit desk within 5 minutes of looking. 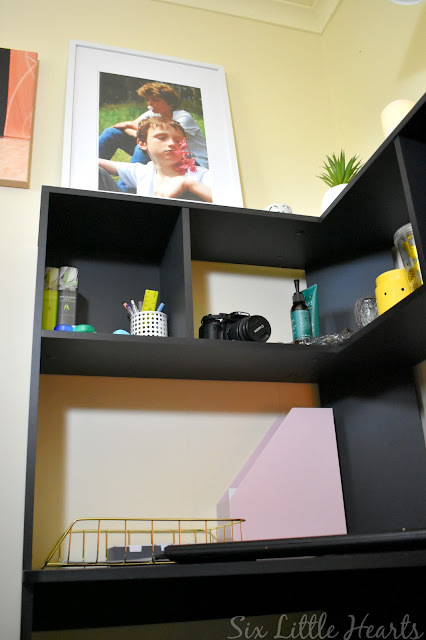 The desk has loads of shelf space in a compact design and was priced at a tiny $60 and just around the corner from our home too. Bingo! Consider framing one of your child's photographs or drawings to create a space unique to them. Gumtree allows you to contact sellers via email, phone, SMS or via the in-built My Messages function, and out of sheer enthusiasm, I chose SMS because it's generally quicker. (I was eager!) I received an immediate reply from the seller to inform me that the item was still available. 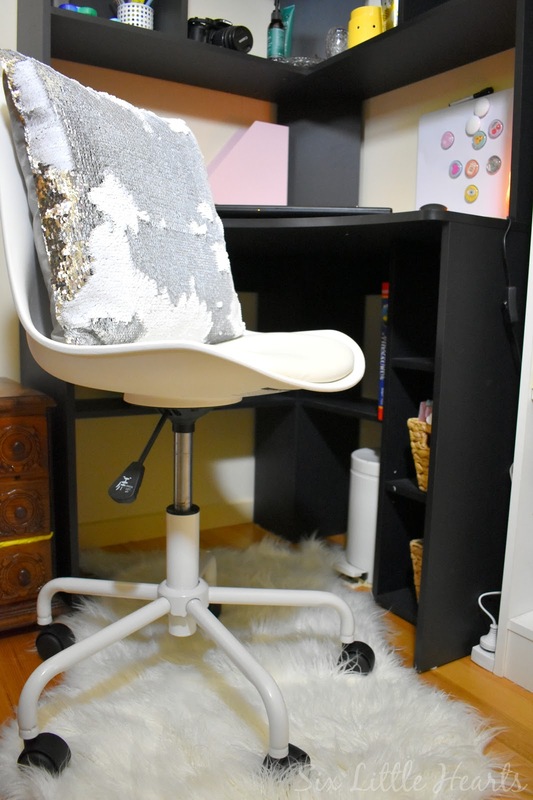 I then made an offer of $50 for the desk (based on the collection of images and description - 'barely used'), which was happily accepted by the buyer! A magnetic whiteboard and funky magnets is both eye-catching and functional. Our seller lived just 4 minutes' drive from our home which meant we had this desk in our daughter's room within days after negotiating a good time to inspect before we bought. With our desk installed, next came the truly fun part - the decorating. 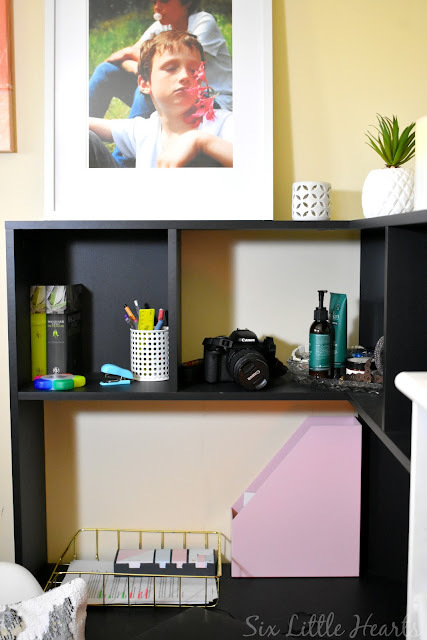 For our daughter's essential student accessories to really bring this desk to life, we paid a visit to Kmart for some funky decor on-a-budget. 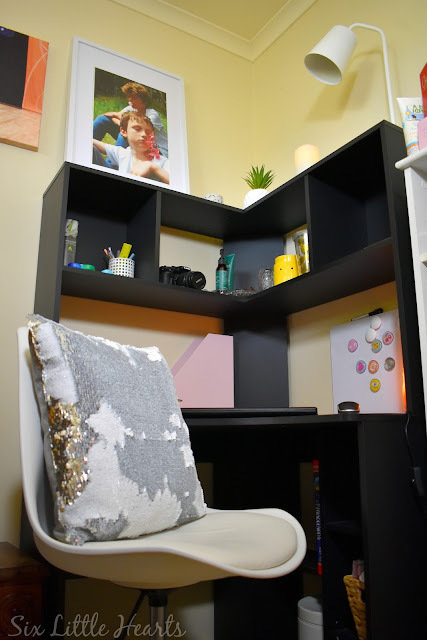 We bought everything from colourful stationery to practical storage baskets, a new matching student lamp and a comfy desk chair and all in shades of white and pink to contrast with the heaviness of the black desk. 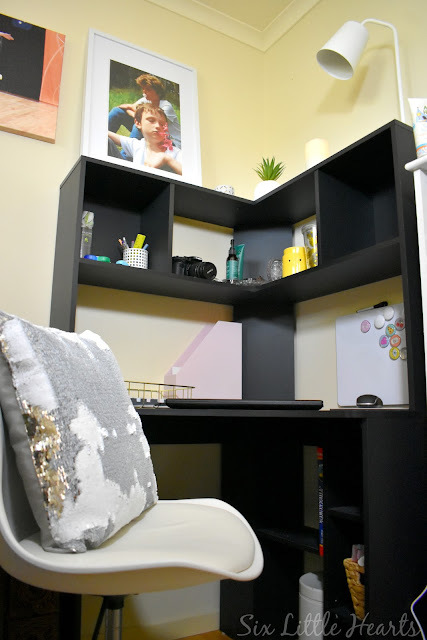 We think we did a great job of her study space and all for well under $200! Desk from Gumtree - just $50! For all our efforts, we're so happy with the results. Without this find on Gumtree, our study makeover may have cost us many times more plus a whole lot of hunting around in time and effort. You too can visit Gumtree to seek whatever it is you desire - even hunt for jobs. A huge thank you goes out to Gumtree for making our makeover a possibility. 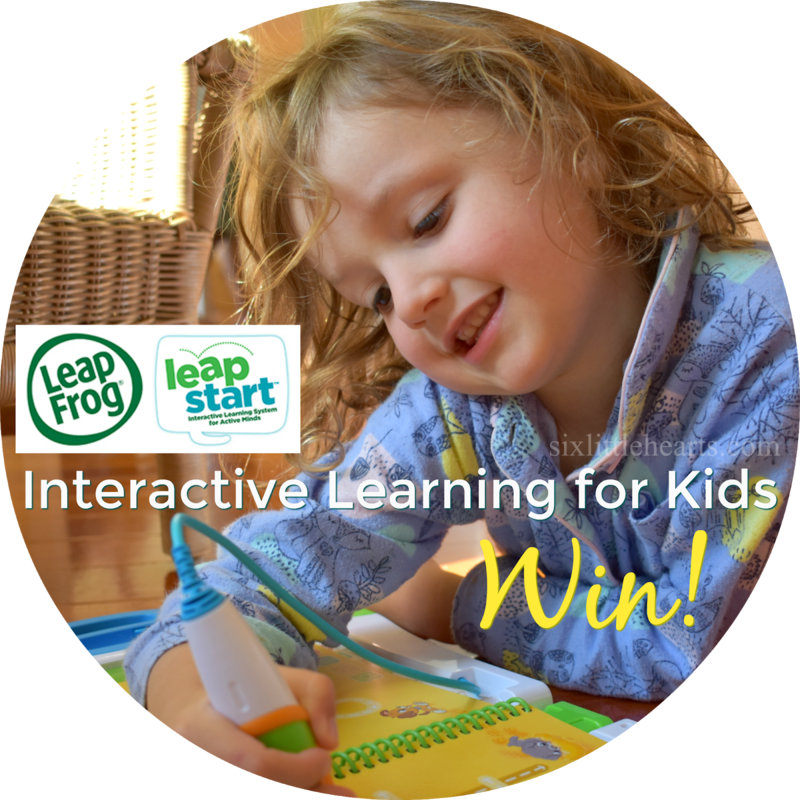 WIN A LeapFrog LeapStart Tablet For Kids. Plus WIN 1 of 3 Book Packs! What a great little space. I have a yr.12 student too and headed to Ikea & office works. Lots to organise.